Blending classic elegance and smart technology, this growhouse gives plants cutting edge TLC. No sun? No time? No gardener on retainer? No problem. Create a lush, carefree, green focal point in your home with our our elegant glass and brass growhouse. Its good looks have a pedigree: the terrarium cases 19th century Europeans used to import exotic botanical specimens. Its behind-the-curtain smarts, however, are cutting edge: Eight full-spectrum LED growlights are controlled by a touch-sensitive timer you set for your plants' daily light needs. Houseplants, kitchen herbs, and leafy greens will respond beautifully to the ideal environment it creates, and the hinged door makes watering and harvesting easy. There's even a fade setting that mimics the transition between dawn and dusk—the fanciest hired gardener can't do that. Components made in Illinois and China. Assembled in Illinois. 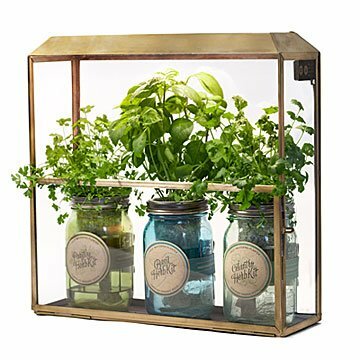 Compatible with our Mason Jar Indoor Herb Garden Kits. Always power off and unplug the Growhouse before cleaning. Use a soft, slightly damp cloth when cleaning LEDs. Do not use chemicals or abrasive cleaners. Timer and 8 LED panel made in Illinois, power cord and brass and glass components made in China, Growhouse assembled in Illinois. So cute and it works! Having a south facing home with little light in any direction, this grow house was a (plant) life saver! It looks great on my countertop without looking crowded and the timer is perfect for everyday use. I currently have two pots with succulent leaves I'm propagating and a small plant in the middle that needed a little extra love! All three are doing great! Best Little Greenhouse on the Market! I use this growhouse to grow kitchen herbs in my home. My herbs are growing very well and are happy in this environment. I like that you can choose the sun level (how long the light is on). I use the 12 on/12 off setting for my herbs. This growhouse is beautiful and the light delivery technology works splendidly. I also used this growhouse to recover a few of my plants that weren't getting enough light this winter. You can also place some plants on the same table as this growhouse and they will get some TLC when sunlight indoors isn't quite enough. I also like how the front half is open so you can reach in and pinch off an herb to cook. The door also works well and has a latch on the side if you ever need to completely open the front. The glass is nice and thick and the brass is sturdy. The whole piece is pretty substantial in weight. It arrived packaged securely. I can't recommend enough!!! The antique brass is really beautiful - we have a modern kitchen and the contrast is beautiful. I purchased with 3 of the mason jars, and they look really nice together, just as pictured in the listing. Yes, I would buy another one. I use this product to grow small flowering houseplants in my bedroom. Easy to set-up and starts growing fast! The lights revived important succulents that decorated the venue for a family wedding in August... the plants look amazing again and the lights are fabulous!